My hair and body are still smoldering from the fire pit in our back yard. 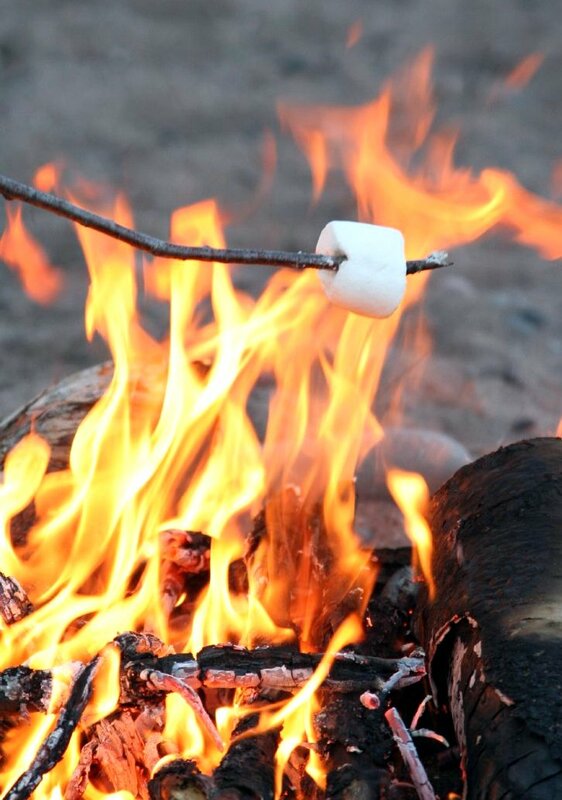 I love the sweet smell of burning wood while roasting marshmallows and making Smores. Tonight felt like summer. Not quite like the Texas summers that I grew up with, where you can’t hardly step outside to sneeze without dripping with sweat, but a perfectly still Michigan summer. The temperature was somewhere in the sixties with no humidity. The Tortoise ran around the yard with her little sister and three friends playing flashlight tag. Now, I smell like summer – a mix of musky wood and citrus mosquito spray. I stopped counting the number of gooey crisp puffs of sugar that I consumed as I finished off a bottle of Sweet Shiraz with my neighbor. The kitchen was cluttered with remnants of grilled hamburgers and hotdogs, corn on the cob and baked beans. Fresh cut raw veggies circled a bowl of ranch dip, balancing out the half-eaten bag of Oreo Double Stuff cookies. The potato chip bag was empty as well as the pitcher of pink lemonade. We had snacked and eaten for hours. Earlier in the day, The Hare was helping me fill up water balloons. She fished out each color in a pattern known only to her, as I stretched the balloons past a plastic nozzle. This nozzle attached to the mouth of our outside hose. It looked like a slightly elongated bottle tip or the top of a puffy paint bottle. For each balloon I had to turn the water slightly on to let a small stream fill up each colorful ammunition. After it was filled properly, I quickly turned the nozzle off, but a tiny trickle would still escape after I pulled the balloon off the tip. I couldn’t help but chuckle, watching myself balance this hose between my legs, the stream of water draining out between my legs from this very phallic garden hose. I’m mature like that. “What’s so funny, mom?” asked The Hare. The Hare chuckled. Then she looked at me confused. Silence while I filled up another balloon. “You do know what boy parts look like, right?” I questioned, distinctly remembering having the anatomy talk with The Tortoise at an age earlier than this. Had we forgotten to talk to the second child? Naw – been there done that, right? Checked off “the list”. We’re not due for another body talk until fourth grade. I have another year! “Yeah, of course mom, sheesh!” giggle, giggle. The Hare hesitated handing me the last balloon. Apparently, our little “talks” haven’t really sunk in completely. I guess I know what I’ll be doing tomorrow. ‹ PreviousYou know that word that rhymes with witch?